At the recent Leukaemia & Lymphoma Research Blenheim Palace Triathlon we spoke after the event to second place finisher Emma Pallant along with Emma's primary sponsor Barrie Wells, who runs the Wells Sports Foundation (www.wellssportsfoundation.org). Barrie first got involved in Triathlon around four years ago, funding the TriGold programme, seeking to identify talented runners with a swimming background and convert them to elite triathletes. Following a successful career as a financial services entrepreneur and with a lifelong passion for sport, notably in Track & Field, where he has supported the likes of Jessica Ennis, Dai Greene and Beth Tweddle, Barrie is the founder and sole funder of the charitable organisation, the Wells Sports Foundation. 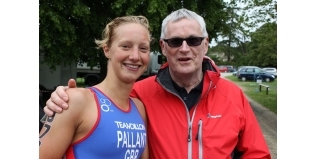 He played a significant part in encouraging the transition of Emma from running - where the was a European Under-23 Cross Country Champion - to Triathlon, where a week after Blenheim, Emma won the British Elite Triathlon Championship. Check out the video below - and you can also find out more about Barrie Wells HERE.